Posted in Improve New Product Launch, Increase B2B Sales, Pricing, Sales, Why LeveragePoint? 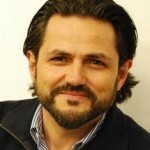 Stephan Liozu, Ph.D. is a Pricing Evangelist and thought-leader as well as the Founder of Value Innoruption Advisors. He specializes in the design of innovative and differentiated business strategies for B2B firms, and the implementation of value-based pricing strategies. His acclaimed Customer Value Modeler (CVM®) certification program trains professionals in value modeling best practices. Dr. Liozu is the author of The Pricing Journey and Pricing and Human Capital. He also co-edited Pricing and The Sales Force, The ROI of Pricing, Innovation in Pricing, and A User’s Guide to Value Modeling, as well as numerous academic papers. He sits on the Board of the Professional Pricing Society, and holds a Ph.D. in Management from The Weatherhead School of Management at Case Western Reserve University. Dr. Liozu is also an Assistant Professor in Strategy and Management at Chatham University in Pittsburgh, PA. Recently, Dr. Liozu presented an excellent webinar based on the lessons he taught in his new book, The Pricing Journey: The Organizational Transformation Toward Pricing Excellence(now available on Amazon). Attendees of the webinar, The 5 Key Dimensions for Achieving B2B Pricing Excellence, learned that innovations in pricing can be transformative, but to reach their potential companies must devote equal attention to technical and organizational capabilities. The 5 C model of transformation was introduced, which relies on change, capabilities, champions, confidence, and center-led organizational design to create effective and lasting pricing strategies. Rooting his recommendations in research and practice, Dr. Liozu proposed specific capabilities to develop on the road to pricing excellence. The book and the webinar prepare pricing and marketing professionals to be true strategic partners, while contributing to the study of pricing transformation. 1. Briefly explain the 5 C model of transformation mentioned in your new book, and how each is important in the pricing journey. Each of the 5 Cs is important but the combination of the C’s also makes a difference. The model was designed and defined based on a series of qualitative and quantitative studies with a total of over 2000 companies. It started with the Champions who set wheels of pricing transformation in motion and make it a strategic priority. Champions decide how the organization is going to be designed and how resources will be allocated. They are very instrumental in deciding whether pricing is going be centralized, decentralized or Center-led. The latter design option is often known as a center of excellence in pricing which has the main goal of diffusing knowledge and expertise along the journey thus creating strong pricing Capabilities. Both champions and pricing experts work hard to make sure the organization can Change and adopt new pricing methods. When things change and people realize the potential positive impact of a pricing program, collective Confidence is built and acts as the fuel of the organizational transformation. There you have it! 5 C’s: champions, center-led, capabilities, change, and confidence. 2. What is the typical payback of companies successfully driving pricing transformational journeys? There are numerous research papers showing the positive impact of pricing transformational projects on firm performance. The consensus from consulting firms is that large scale pricing projects lasting 2 to 3 years can increase EBIT levels by anywhere between 3% and 6%. Something to keep in mind here is that the payback comes from both design and execution of pricing programs. I have a rule of thumb that every $1 invested in pricing should yield $7 to $10 in incremental profit. That is a good benchmark. 3. What internal barriers can I expect during the pricing journey process? There are many potential roadblocks that can slow down, derail or interrupt a pricing journey. Because of the long-term nature of these transformational projects, they are a series of controllable and uncontrollable factors that may impact the journey. Some of the uncontrollable factors might include a change of CEO, a large M&A integration project or a disruptive economic recession. Controllable factors include under-estimating the change management challenge, rushing the journey, or making the wrong pricing investments at the wrong time. So it is important to be ready for the ups and downs on a journey. Preparing for a pricing journey is like preparing for a marathon, not a sprint! 4. Where do you suggest starting a pricing transformation effort to achieve the fastest positive results? New product launches are, by far, the best opportunity for companies to capture more profit and growth using value-based pricing. 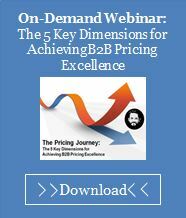 It is an area that is ideal for starting the value-based pricing journey. Companies have seen 1-3% increase in revenue and profitability for new products that may have been previously priced based on traditional competitive or cost plus methods. 5. When you think of responsibilities, who should own what? How do you make members of a team accountable for value-based pricing and price realization? Pricing is a true multi-functional discipline that potentially touches everyone in an organization. This is what I call the journey towards pricing excellence a transformation and organizational innovation. During the journey road mapping process, the project team is going to be listing all relevant functions that might be touched by better pricing methods. Typical functions include sales, marketing, and customer service for example. But others need to be involved as well: HR, marketing communications, and technical services for example. The key is not to leave anyone behind especially if they have customer relational or transactional interface. Once all stakeholders are identified and involved, then it becomes pure change management work. 6. How does the sales force benefit from companies achieving pricing excellence, and what are your tips for supporting sales adoption? The sales team is a critical stakeholder in and of the pricing journey. They have to be integrated from the get-go in the design of the journey. They have to be involved in conducting specific projects and initiatives because in the end, it is all about making their sales job easier and more efficient. The outcome of great pricing projects is to reinforce pricing power and sale effectiveness. Large scale pricing transformational projects traditionally touch on segmentation, competition, and differentiation, value-selling for example. All of these are concepts that are critical to improve selling. 7. How can technology help with the pricing journey? Technology is an accelerator for the pricing journey. As more and more people, regions, and products are embracing progressive pricing practices, technology allows to systematize the deployment of pricing programs and to quickly proliferate best practices. Some of the enterprise-wide technologies also allow for a certain amount of synergy and standardization. The real question is to know when the organization is ready for technical resources or tools and to make sure they are deployed using progressive change management support. Along the journey, more tools are introduced to pricing users and price setters. Each time, pricing teams have to focus on change adoption and confidence development so that tools are assimilated and mindsets are changed. 8. Are there any differences implementing pricing transformation in global enterprises versus companies under $1 billion in revenue? In pricing, size does not matter. Whether the firm is $10 million, $100 million, or $1 billion in sales, the key to success is to get started and to design a journey that makes sense for the company’s size in a dynamic environment. Pricing journeys cannot be copied and pasted. The discovery and design phase of the journey is critical up front. There is a myth out there that pricing is only for large firms with lots of resources. This is not the case. You can get started on your journeys with small investments. The key is to invest in the right methods and tools at the right time. 9. Do you see any differences between US and non-US enterprises implementing pricing transformation? Not really. I think it is more a question of the organization’s culture and leadership power than geography. However, I do see more and more global organizations embarking on pricing journeys and have variable success by geographical zones. Deploying pricing strategies globally remains a challenge because of cultural differences and regional dynamics. This is why journeys can take a long time. For a large firm to have pricing practices fully assimilated around the world is a real challenge. 10. Can you make this happen before the C-suite gets on board? Like any transformational initiative, the C-suite and the CEO need to be fully on board. They have to be engaged in the project and burn political capital to support the project. People in organizations pay close attention to what people in the C-suite do, act upon, and support. If the C-suite is not on board, the rest of the organization will have a tough time believing that pricing is a strategic initiative. This is why I often do specific training and coaching with members of C-suites in order to get them to champion pricing journeys.